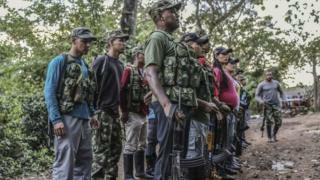 Colombia's Farc rebels have threatened to delay their demobilisation, saying the government has repeatedly broken the terms of last year's peace deal. Farc leader Rodrigo Londono, known as Timochenko, made the warning after the arrest of a rebel - a move that went against the terms of the deal. President Juan Manuel Santos said there had been "confusion" over the arrest and the situation was being resolved. Under the deal, the left-wing rebels are due to disarm by 20 June. Timochenko issued the warning on Twitter late on Sunday, accusing the government of violating the terms of the peace deal agreed in November 2016. He also said the rebels would seek "international monitoring" of the agreement. It not clear what he was referring to, as the UN already has a mission in Colombia that oversees the implementation of the deal, the BBC's Natalio Cosoy in Bogota reports. Meanwhile, President Santos insisted that from the government's point of view the current timetable for the implementation of the agreement remained unchanged. Thousands of Farc rebels have already handed over their weapons since the deal was signed. About 260,000 people have been killed and more than six million internally displaced in Colombia during more than five decades of the conflict.